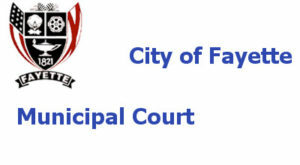 The Fayette Municipal Court convenes on the 1st and 3rd Tuesdays of each month, unless changes are necessary due to holidays. For a detailed schedule of court days, consult the City Calendar. —- OR you may click the button below to pay online with Visa, MasterCard, Discover or Debit Card. A third party processor will charge a 3.5% or $3.00 service fee for using this service. If you do not appear in court or your payment does not reach the court office by the court appearance date on your citation, YOUR DRIVER’S LICENSE WILL BE SUSPENDED and a warrant issued for your arrest. All other traffic offenses require a court appearance. Fine and court costs are subject to change without notice.